The Youth Service of America honored Berni Barta with the Gladys Marinelli Coccia award at the National Service-Learning Conference in San Jose on March 26, 2010 during the State Farm Awards Ceremony. The award was founded in memory of Gladys Coccia, who began her entrepreneurial career as a young girl in West Virginia and went on to become a successful businesswoman and community leader in Washington, D.C. Berni was one of two girls to win this award and was granted a $2,000 donation for Kid Flicks. For more information visit YSA News. Harvard-Westlake School honors graduating senior Marni Barta for her community service leadership. Marni was awarded a $500 grant, which she used to help fund Kid Flicks. Marni was named a 2008 Build-A-Bear Workshop® Huggable Heroes® finalist. She was one of 31 young people from around the world being honored by Build-A-Bear Workshop® for demonstrating strong leadership, dedication and compassion to make positive strides in the world. For more information visit Huggable Heroes. 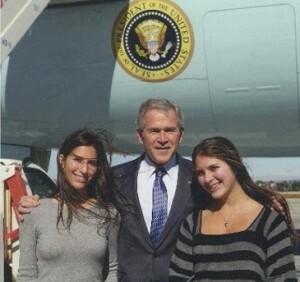 On January 29, 2008 Marni and Berni Barta received the President’s Volunteer Service Award from President George W. Bush when he visited Los Angeles. After he presented the Kid Flicks founders with the award, the girls were given a private tour of Air Force One. Marni and Berni Barta of Kid Flicks were honored as a Daily Point of Light on October 10, 2007.